Can I just say that I am so blessed to be surrounded with such loving and caring family and friends but if have to choose someone really special it is my daughter in law. She is so unselfish and kind in such a quiet,unassuming way. I truly love her and I am so happy to call her my friend. 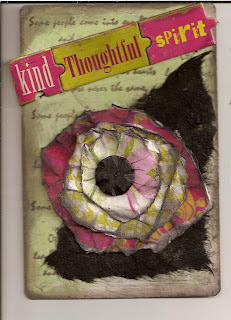 For this card I stamped the background and then made a paper flower. I added some chipboard pieces and torn black paper and I inked the whole think in black chalk ink.